Primary's NYC Seed Deal Report is your go-to resource for all NYC tech seed investment activity, including funding amounts, sectors, investors, company information and noteworthy trends. Please note that our report covers only those seed deals (which we define as $250,000-$3.5 million) that have become public. We know there are deals that have closed but not yet been announced, including some of our own, and those will be included in subsequent reports once they are public. We’d appreciate your help in making this report as comprehensive as possible; please contact us at info@primary.vc to let us know of any deals that should be added. As the frequency and intensity of cyberattacks continues to grow, significant federal and private investing in information security follow an upward trend. Gartner notes that worldwide infosec spend surpassed $75 billion in 2015 - a 4.7% increase from 2014 - and is expected to reach $170 billion by 2020. Accordingly, venture capital investment in security-related startups has followed suit, having grown 40% each year over the past five years. New York, itself, continues to be an important global hub for information security, with its critical mass of security-sensitive financial institutions as the key driver. This quarter saw seed financings for BigID and AnchorID, both focused on identification verification for transactions and access management; Chainalysis and yoPay, which are focused on identity verification within the fintech sector; and TopPatch, which helps companies protect data and manage access for secure collaboration. Security concerns arise in the social category, as well, with messaging platform Confide that enables users to send encrypted messages that self-destruct. We continue to see investor interest in subscription services, with recent funding going to LOLA (feminine care), Scentbird (perfume), Stash (investing) and Skyfit (fitness). This will be an area of continued focus, as even traditional retailers - including Walmart, Amazon and Target - are toying with the subscription box business and driving up competition. While the media tends to focus on women-run startups, there’s a growing proliferation of startups focusing on women as consumers. 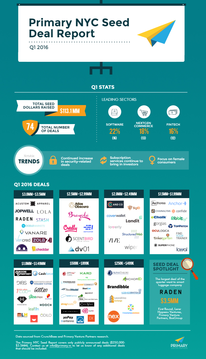 Q1 saw the funding of Brayola, Vive, Landit and Girls Who Code, with additional rounds for LOLA and Scentbird, following their Q4 success. The largest seed deal of the quarter goes to Raden, a smart luggage company looking to ease the burdens of travel with built-in chargers, integrated scales and proximity sensors - all built into a premium product at an accessible price point. Raden raised $3.5MM in a round that included First Round, Lerer Hippeau Ventures, Primary Venture Partners and BoxGroup.